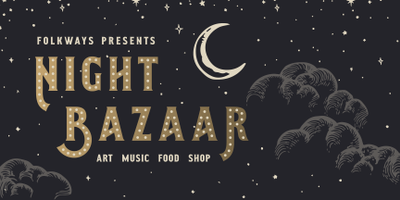 Enjoy an evening of food, music, art, and performance at Folkways' Night Bazaar. Like the evening bazaars of southeast Asia, visitors can shop for trinkets and handmade goods from local artisans, enjoy street food from the food trucks and carts, and grab a drink from Front Street Taproom. Visitors can try unique experiences like a henna tattoo, a tarot card reading, drawing sessions with Draw Club, or see the circus entertainment and photo-booth by KatiRose. This event is free and family friendly. Live Music: 5-6pm: Travis Naegle 6-7pm: Fancy That 7-8pm: PatWood (Pat Lenertz & Travis Atwood) 8-9pm: Ric Todd More info and full list of vendors and experiences at www.folkways.co/nightbazaar Sign up to volunteer: https://www.signupgenius.com/go/30e0548adac2da5f58-night2 Missing the Night Bazaar? Mark your calendar for September 27th and October 25th.